Just Arrived ! 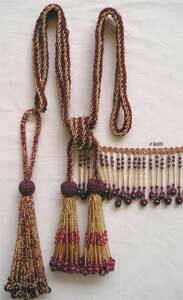 Promotionally Priced New Beaded Tiebacks in beautiful Colors.. Order Matching Tassel and Fringe ! Can be made in colors of your choice All our Products are made in- house and can be Custom made as per specifications in Color, Design and Size When the correct number of items that you want to purchase is in your basket, simply click on "My Cart Positioned on the top of the right side screen".